All I heard was, “he called me a terrorist!“, and it was downhill from there. When the dust settled and I was able to get some answers about what had so quickly escalated into a war of words, it was really very simple: M had laughed at T’s name, so T called M a terrorist. And in the way of seventh grade boys, the words continued to fly back and forth. Just a week earlier I’d had to step between two other middle-schoolers who were about to get physical because of similar taunts. As I began to intervene, another teacher (who just happened to be walking by?) opened the classroom door in time to see and hear enough to immediately call out M.
I asked T if M’s accusation was true; had he called M a terrorist? He readily admitted he had. I genuinely appreciated his honesty, and said so. But I also said that’s not acceptable, and sent him on his way with the other teacher and his adversary. The exchange had a certain tragic irony, coming as it did on the anniversary of the 9/11 terrorist attacks on the US. But in this unruly middle school English class, it opened the door to a lesson in both history and current events – for when are the two ever unrelated? I am a Cold War veteran. I served close enough to the Soviet Union that we took very seriously the threat of missile strikes. I worked less than eight miles from an ICBM (Inter-Continental Ballistic Missile) base being built to counter that threat. We lived and served under the ominously-named policy, “Mutual Assured Destruction.” Until…. Until two courageous leaders sat down across a table and dared each other, not to a bigger fight, but to end the escalation, to stop building missile bases, to reduce the nuclear stockpiles. 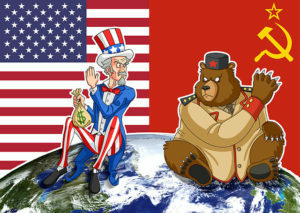 While many around them chanted the political version of “fight, fight, fight, fight,” U.S. President Ronald Reagan and Soviet General Secretary Mikhail Gorbachev shook hands and said, No. (Or nyet.) While many in both lands feared their adversaries could not be trusted, the two leaders dared to trust. The type of exchange I’ve seen in the classroom has become the norm not only in middle school, but across the country and at nearly every level of society. We have programs and curriculum to fight bullying at school, but our kids see the bullying happen at home, in the community, on the news, in the government. We need courageous, humble leaders for middle schoolers to learn from. We need teachers who will step in and bring perspective. We need parents and grandparents, mentors and spiritual leaders who will demonstrate the gut-wrenching love to convince kids of their value and worth. We need government leaders who will acknowledge that those on the other side of the political aisle really want the same thing: the best for our communities and nation; and then will work together to achieve unity and peace and healing within our land. It’s not easy. Humility never is. But it is right and good and best. *Please note: I am not defending indefensible speech, bigotry, hatred. I am merely stating what Dr. Martin Luther King, Jr., lived: the humble, often quiet fight of non-violence that can shut down hatred and move a nation. We have a long way to go, but we’ve made a start. This entry was posted in 9/11 on September 12, 2017 by Randy Ehle.